The theme of this blog is birds and water. The Warblers have arrived in Seattle on their spring migration north. 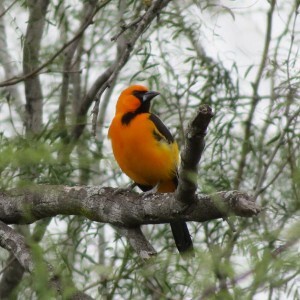 Butyl Creek was busy on May 3 with Warblers of four species, Orange-crowned, Yellow-rumped, Wilson’s and MacGillivray’s. Eighteen species (including the 4 sp. 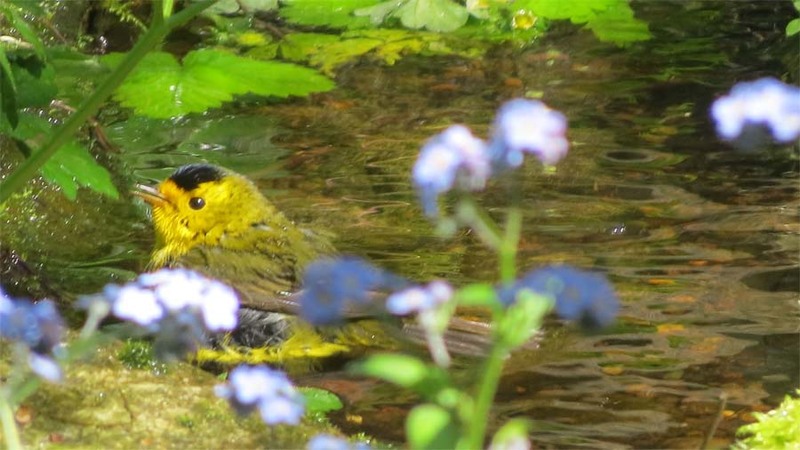 of Warblers) bathed in the creek that day. Butyl Creek is our 15 ft. long recirculating creek in our backyard in residential Beacon Hill, Seattle. 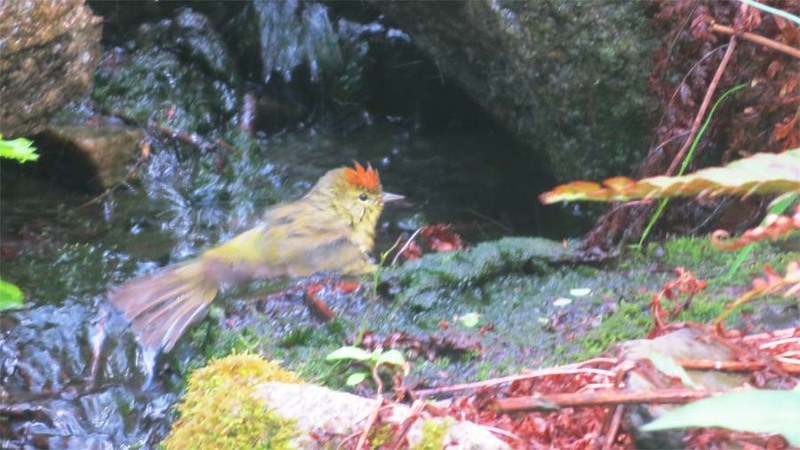 You rarely see the orange crown on an Orange-crowned Warbler, but when they bathe, you can’t miss it. 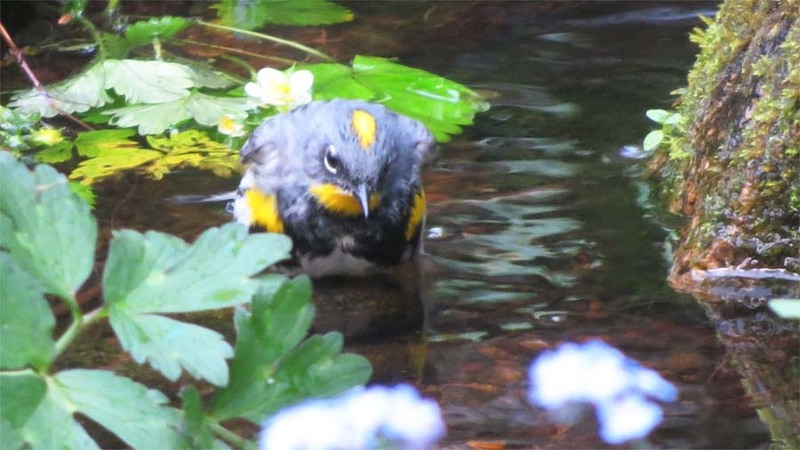 This Wilson’s Warbler seemed to get pensive in the creek. A Yellow-rumped in one of the bathing pools. We-(Brian Pendleton, Delia and I) went out to the Snoqualmie Valley yesterday. It looked like spring out there although it didn’t totally feel like it. 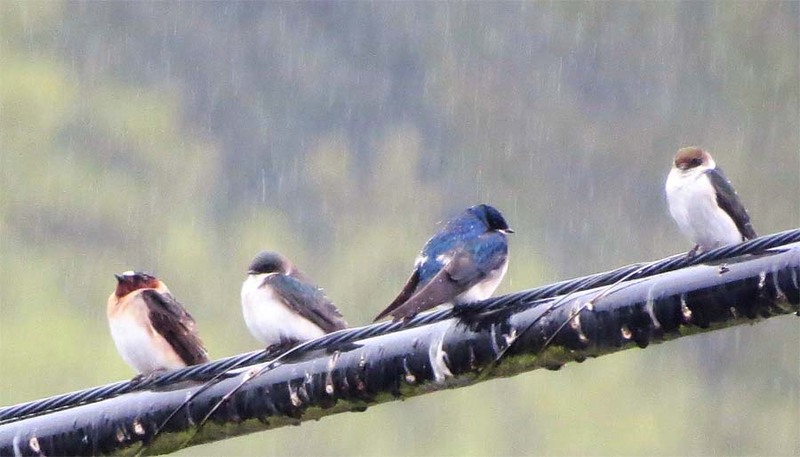 We found about 300 Swallows holed up at Cherry Valley Wildlife Management Unit just north of Duvall. When they weren’t flying around the extensive open wetlands they were lined up on the powerlines. We had at least one Rough-winged Swallow. 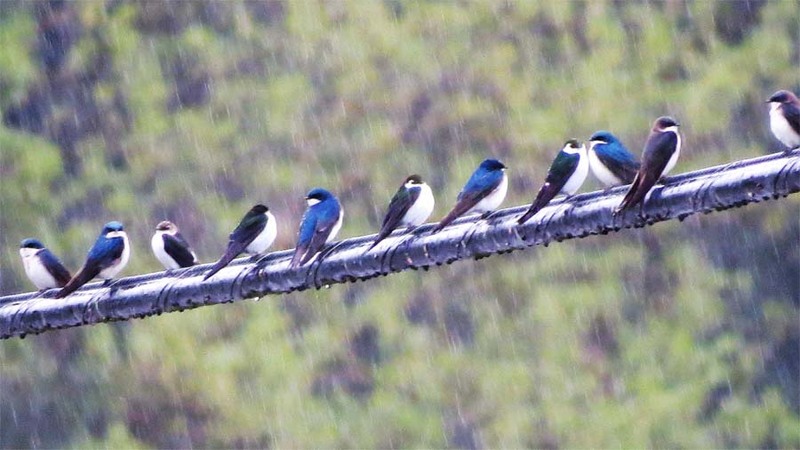 The rest were Tree Swallows, Violet-green Swallows, Barn Swallows and Cliff Swallows, maybe in that order. 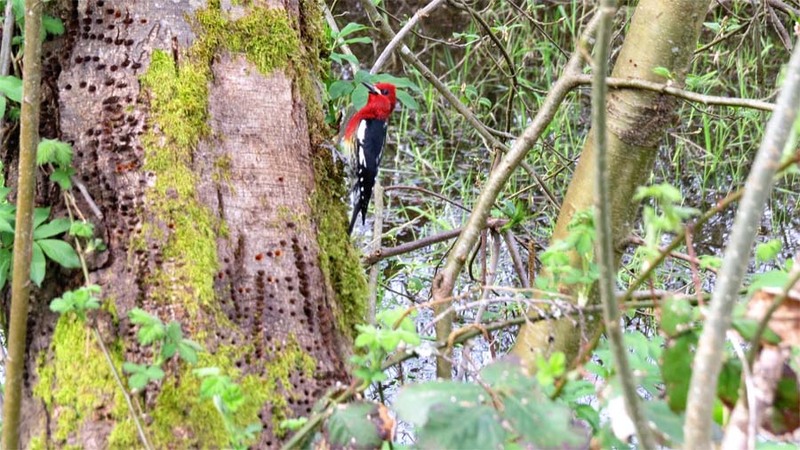 The shots I got with my Cannon Powershot weren’t entirely in focus and the rain didn’t help that but they convey the beauty of these incredible birds that go pretty much unnoticed around here–they are currently disappearing from Seattle where they used to be abundant. 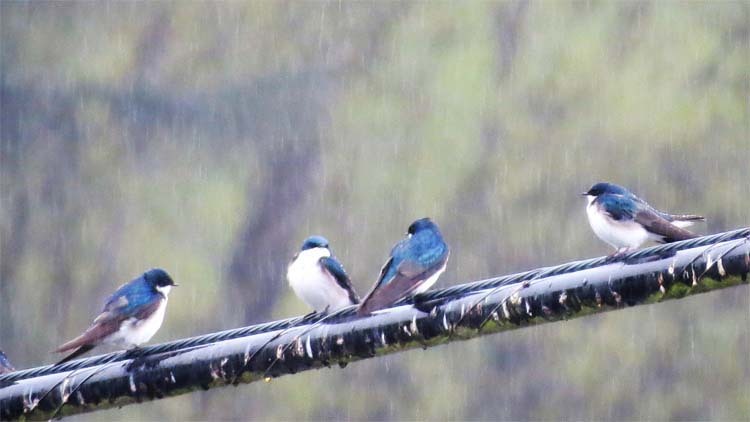 The Tree Swallow, which lives in estuaries that have timber, may be doing the best on the West-side of the four species shown–that’s just my opinion though, not based on data. 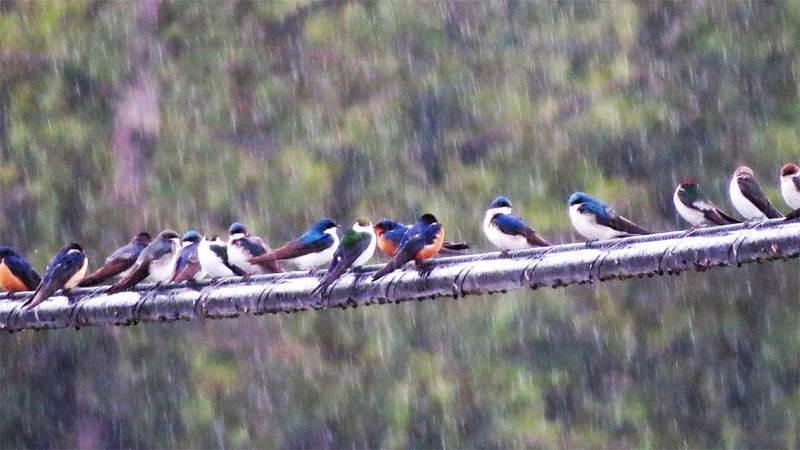 The first picture shows Barn Swallows, Tree Swallows (blue and white) and Violet-green Swallows (green). 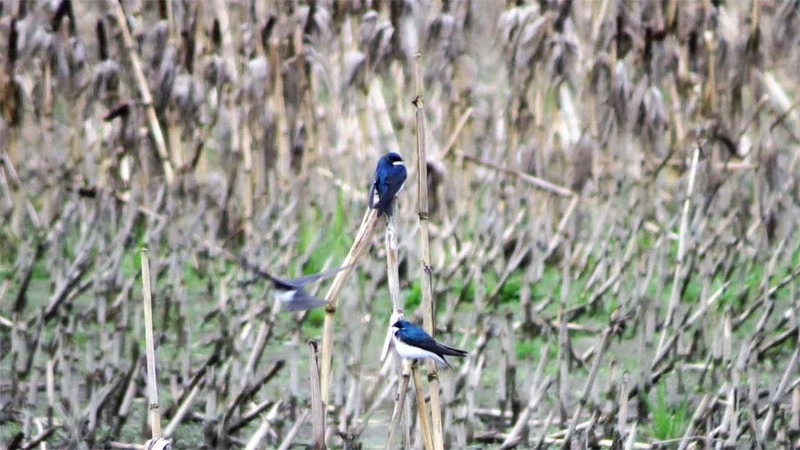 This shot shows Tree Swallows and Violet-green Swallows. The brown-headed Violet greens are females and young. 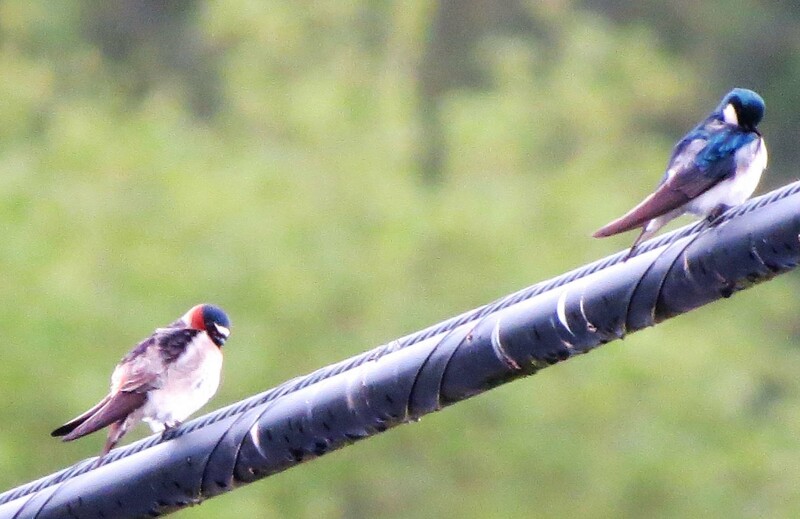 Here are two male Barn Swallows and Tree Swallows. And these are all Tree Swallows That’s a cliff Swallow on the left, two Tree Swallows and a young or female or both Violet-green on the right. 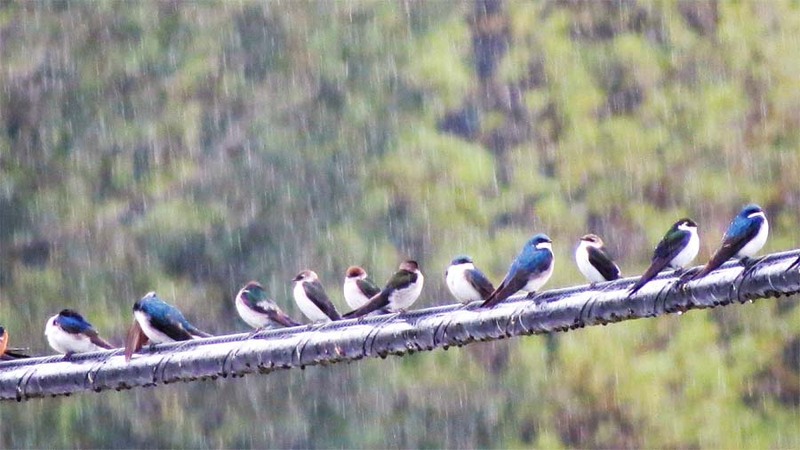 Tree Swallows are blue or steel-brown, Violet-green are green on the back with white over the eye. It looked like some of the birds were going to spend the night on corn stalks. 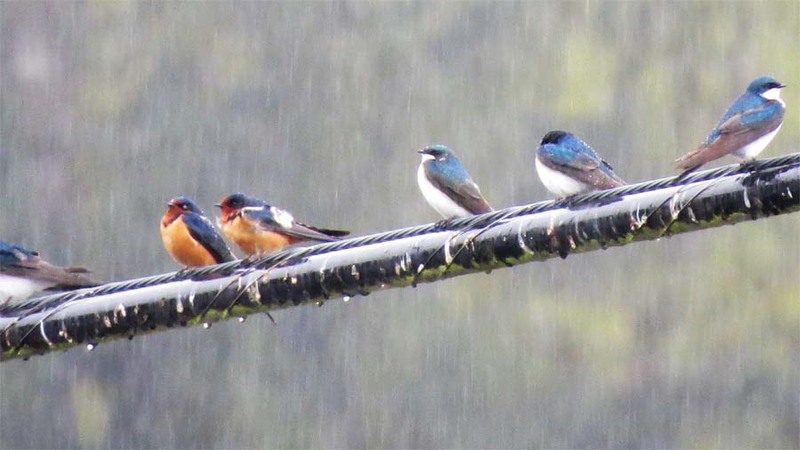 These are Tree Swallows. More shots from the spring of 17. 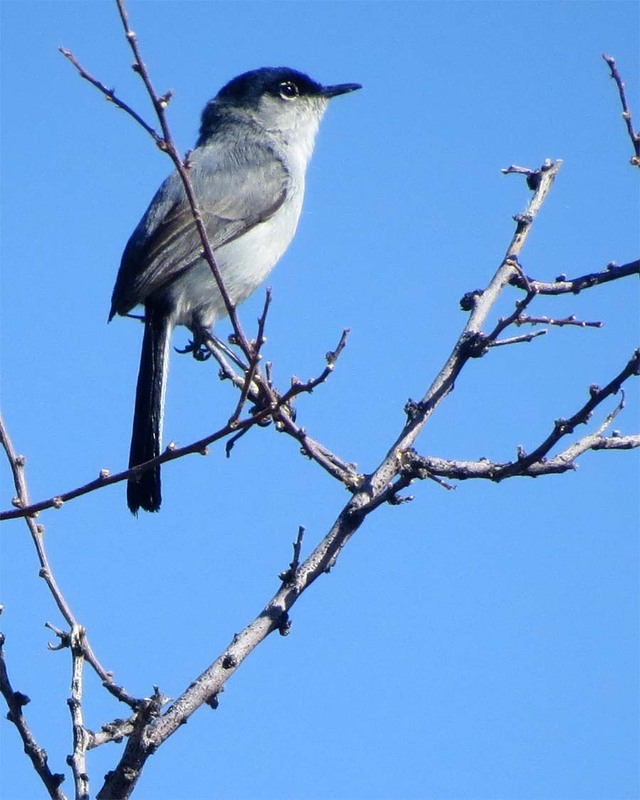 This Black-tailed Gnatcatcher was in the San Simon Valley on the NM/AZ border in April. This Javelina was in a group that ambled away from us. Seems like Javelinas in the outback used to really hoof it when they saw people. 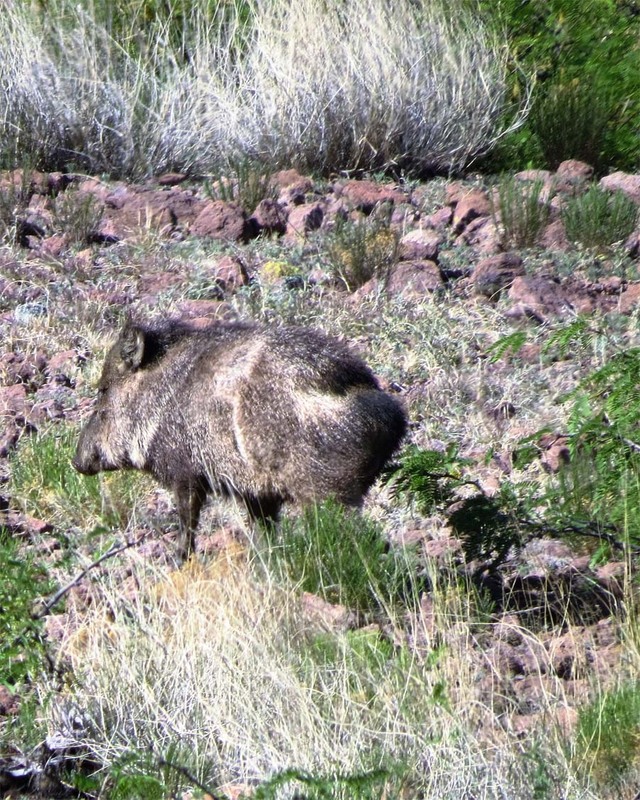 Maybe Javelina hunting is on the decline. 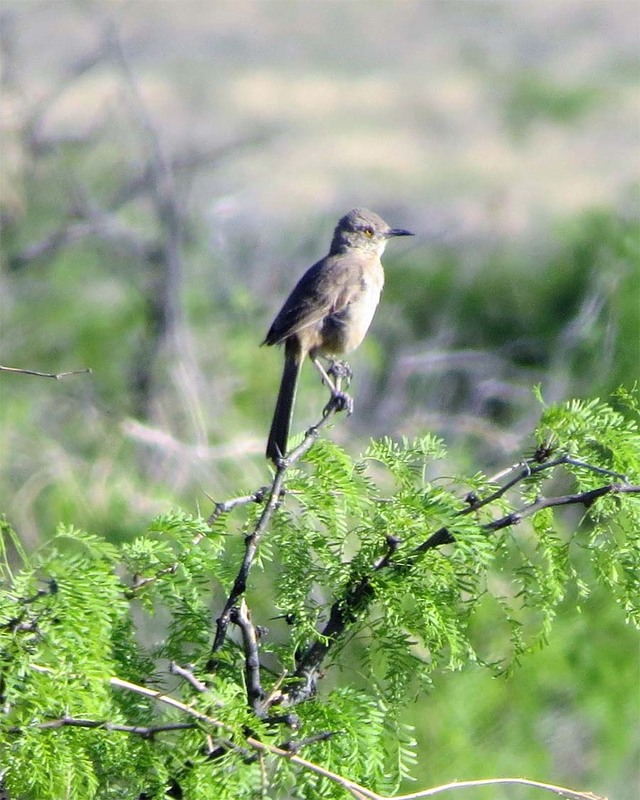 Here’s a Bendire’s Thrasher in the Valley. 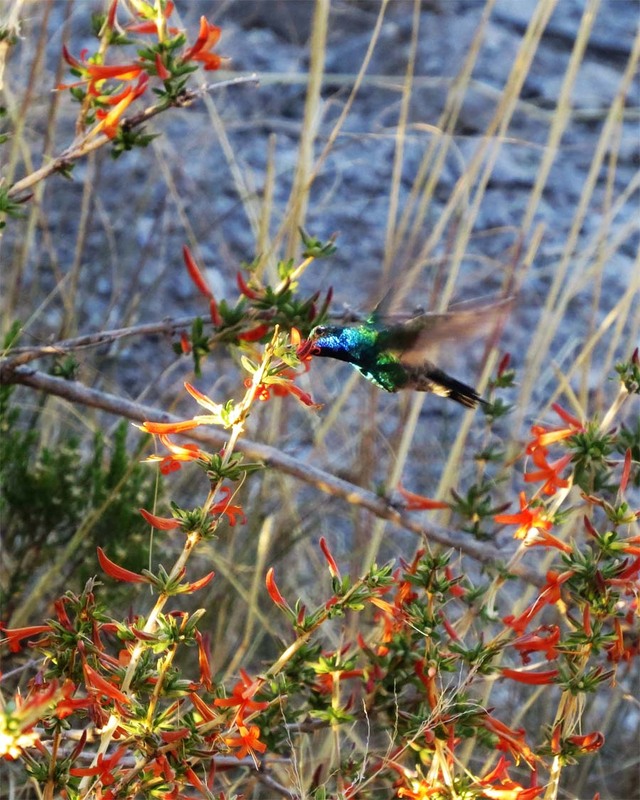 A Broad-billed Hummingbird works through a patch of Desert Honeysuckle up at the ranch. This is mid April. 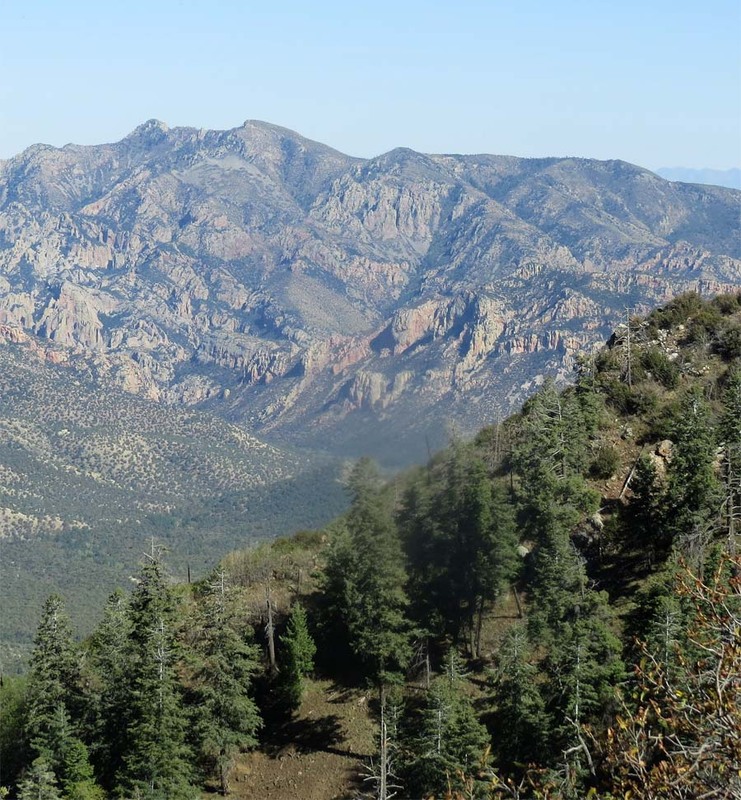 We made one foray up to the High Chiricahuas, we had such a great time up there last time, we wanted to see if lightning struck twice. 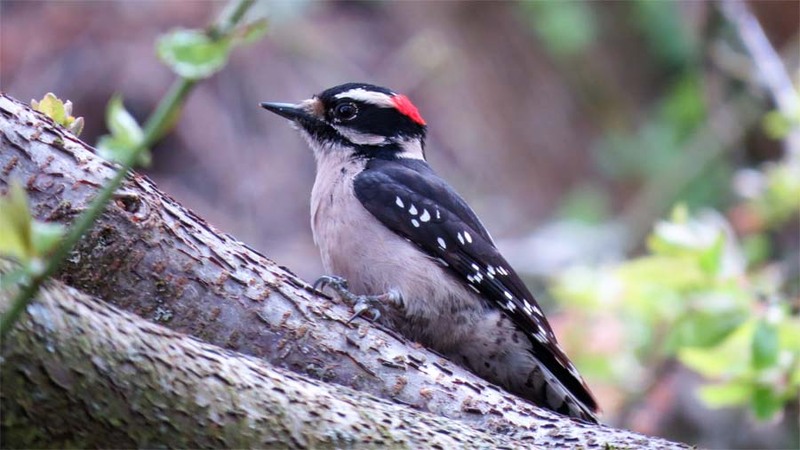 There were great birds up there, including Olive, Grace’s, Hermit, Red-faced, Townsend’s and Black-throated Blue Warblers, but the light in the high pines and the stiff afternoon spring breeze made conditions strangely difficult for us and we ended up taking a rain-check on most of them.